Wow, I’m surprised he did so well on the test. He’s not ghetto like those other boys. Microaggression: a comment or action that subtly and often unconsciously or unintentionally expresses a prejudiced attitude toward a member of a marginalized group (such as a racial minority). Quite simply, these micro-messages dress up as “great intentions” or “truths” but are dangerous at the core. This danger lurks in the ignorance that trails from these seemingly innocuous statements. For students, especially students of color, microaggressions can be like darts repeatedly thrown their direction with lasting effects unbeknownst to their peers…..and even teachers. I know all too well what it’s like to be a student of color in a predominately White school. I endured microaggressions long before I knew what they were. Myself, like many other African-American students, wondered why my correct grammar was a surprise…..why my manners were an anomaly…..and why “being intelligent” was praiseworthy rather than a given. As adults, experiencing microaggressions is nothing short of annoying and frustrating; however, as adults, we have some tools to cope. On the contrary, students often lack these coping mechanisms to navigate these messages. Imagine being an African-American student and experiencing the awe and shock from others when you excel at something. Imagine being a Latino student facing the assumptions that you speak Spanish. Imagine being an Asian or Indian student and the facing the disappointment when you don’t do well because you’re Asian or Indian and you are “supposed” to excel academically. Right? Imagine other student populations from SpEd, to 504, to ELL, to Economically Disadvantaged. Imagine the automatic low expectations others have of you. Imagine microaggressions placed on top of what our system has already labeled you. How would you feel? How would react from the daily comments, looks, low rigor/expectations, and frustrations from the adults around you? Typically, these elements end up affecting BEHAVIOR. As background information in the study points out, the negative effects of discrimination on human development have been documented many, many times in prior studies. Much of that research has been with adults, but studies involving adolescents have found that young people who report more experiences with racial or ethnic discrimination are at greater risk of depression, substance abuse and risky sexual behaviors. They are also less likely to be engaged with and successful in school. Only a few such studies have examined the issue in children as young as 10, but those findings have been similar. One study, which involved African-American boys aged 10 to 15, found that children’s reports of ethnic-racial discrimination were linked with behavioral problems, feelings of hopelessness and poor self-concepts. The current study is one of the first, however, to look at how children younger than 10 perceive experiences of discrimination and how those perceptions affect their development over time. It’s clear that what we think about children and how we communicate our thoughts and expectations have grave effects on who they are…..and who they may become. Expectations can be communicated verbally and non-verbally. We know that students are extremely perceptive and intuitive. Children are able to understand certain vibes and emotions even when they cannot fully articulate what is happening. Point blank. Kids know when something is up. Having observed a wide array of classrooms over the years, I have learned that students are indeed picking up on microaggressions, yet they lack the terms to communicate such. My teacher doesn’t like me. My teacher picks on me. My teacher doesn’t think I can do the work. My teacher thinks I’m lazy. My teacher thinks I’m bad. …they may be feeling the weight of microaggressions. Yes, are there some students who may use these phrases to deflect their own irresponsibility? Sure. However, I have noticed that there is an overwhelming amount of truth to these statements. Often, the stories behind these statements are crushing and you realize that very few are using microaggressions as an excuse to underperform. 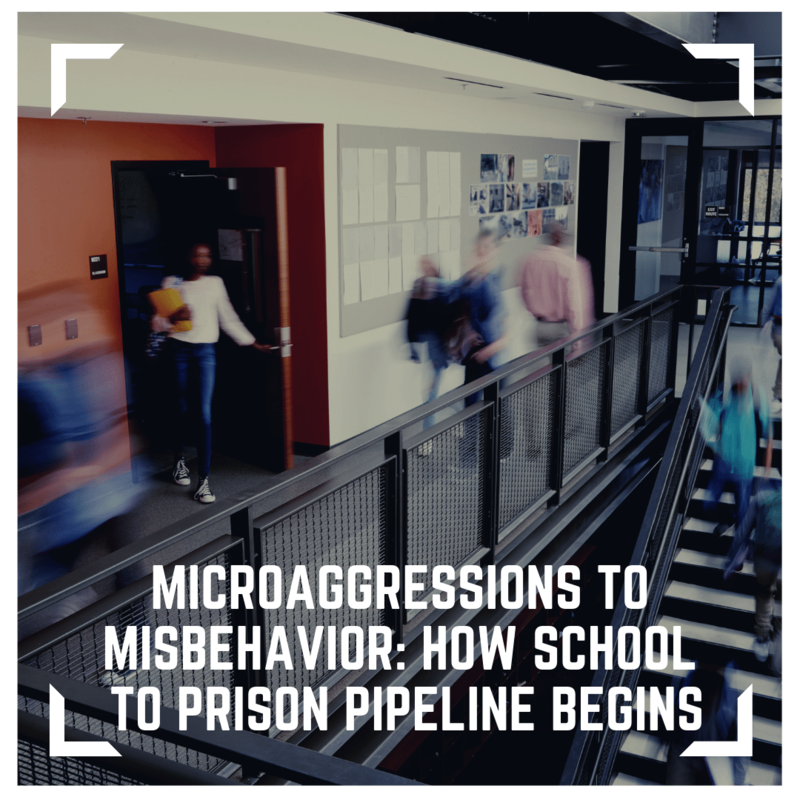 It wasn’t until I left the four walls of my middle school English classroom, that I was able to fully see the effects of microaggressions on student behavior and academic achievement. I would witness White students exhibit disrespect and disregard for their teacher’s classroom and instruction and simultaneously watch a Black student be reprimanded for asking for a pencil (because no one should be talking, right?). It was common to see students of color kicked out of class and sitting in the hallway. What were their “crimes”? He took too long to turn around when I told him to sit down. Teaching is not even close to easy and I understand being in the throes of a large load of students, with varying levels, different personalities, and even the joy of middle school defiance. Witnessing these situations daily, I began to wonder….what’s the reason? Why are the same students being kicked out of class or reprimanded more than others? I initially chalked it up to a tolerance level. I had seen worse in my previous teaching experiences, so talking or having candy wasn’t a grave enough “crime” for me to remove a student from instruction. Of course one cannot allow one student to derail a class, but when there is a trend or the same groups of students being disciplined, we must look further. We must be more reflective in our practices. We function in an educational system that was built on Eurocentric values and culture. The beginnings of our entire school system included the assimilation and/or exclusion of other groups. Many people of color lost their language, culture, and traditions in efforts to assimilate to the core and values of Eurocentrism. Over time, our system has evolved and in some ways progressed. However, our mindsets have remained stagnated even through structural and legalistic changes. What strides have we continued to make in education to eradicate the low expectations of students of color? What continued strides have been made to remove stereotypes, biases, and prejudice from our educational practices? From our own mindsets? Students from two groups—racial minorities and children with disabilities—are disproportionately represented in the school-to-prison pipeline. African-American students, for instance, are 3.5 times more likely than their white classmates to be suspended or expelled, according to a nationwide study by the U.S. Department of Education Office for Civil Rights. The school-to-prison pipeline starts (or is best avoided) in the classroom. When combined with zero-tolerance policies, a teacher’s decision to refer students for punishment can mean they are pushed out of the classroom—and much more likely to be introduced into the criminal justice system. Parents send their best (our students) to school each day whether we believe it or not. Children should not be defined by their zip code, circumstances, race, or their economic statuses. However, schools use all of these factors to label students for data purposes. I believe this is one of the avenues that begins to perpetuate the cycle. If teachers already have biases they are unaware (or aware) of, utilizing these labels to discuss student progress can further certain stereotypes and microaggressions. If campuses are not actively exploring, identifying, reflecting, and working on these biases and misinformation about student groups, children will continue to be in classroom environments that weigh them down versus building them up. Are we focused on using positive behavior supports? Are teachers adequately trained in these supports? Are we mindful of our discipline referrals and the fairness, or lack thereof, for reprimanded students and student groups? Are bias and diversity training for all staff a priority on a continuous basis? Are discipline systems tiered so that students are not missing instructional time for minor infractions? How often are teachers trained in classroom management and relationship building practices? Are students authentically engaged in learning? If not, how can we increase engagement across the campus? How can we build a stronger community and parental partnerships as a campus? Are we teaching students how to appropriately advocate for themselves and their needs? In the words of the prolific writer, James Baldwin, “Not everything that is faced can be changed, but nothing can be changed until it is faced.” The School-to-Prison Pipeline is not a myth, and if we don’t face the fact that the pipeline begins with schools, we will not ever fully change the trajectory of these cycles.